The Barlow Collection of Chinese Ceramics, Bronzes and Jades is one of the most significant of its kind in the world. 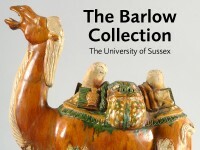 Prior to 1 October 2009 the collection was open to the public two afternoons a week from 1pm-4pm [at The Barlow Gallery in the University of Sussex Library building]. About twenty per cent of its total of 450 objects were on display at any one time. The collection is particularly strong in the ceramics of the Tang (618-907 AD) and Song (960-1279 AD) dynasties, with an emphasis on a simplicity of form and decoration that was very much the taste of its founder, Sir Alan Barlow. Objects in the collection span three millennia with most periods of Chinese history represented, from the ancient Shang dynasty (c.1700-c.1050 BC) to the last dynasty, the Qing (1644-1911 AD). Tang dynasty tomb figurines, outstanding fine lead-glazed earthenwares and stonewares and excellent examples of the world’s earliest porcelain form the highlights of the collection. In 2006, the Arts and Humanities Research Council funded a project to put the catalogue of the collection on line and we invite you to browse and learn more about the objects in the collection. The Barlow Gallery in the University of Sussex Library building has been closed since 1 October 2009 during the Library refurbishment. Following a review by Trustees initiated in 2008, the collection transferred in summer 2011 to the Ashmolean, Oxford where it [went] on public display again.